You will need very ripe bananas...I left my in the fridge for a few days...Lovely, no? Combine all the cake ingredients, except the bananas and toffee bits. Mix as directed. You'll have a nice fluffy batter. Mix in the bananas and toffee bits until just combined. Pour into pans. Even them up! Bake until a toothpick inserted comes out clean. The cake will be springy to the touch. BCL's recipe said 38 minutes, and by god, it was 38 minutes! Let cool in the pan for 15 minutes. Most box mixes say to cool for 10 minutes. NO WAY! Gently remove from pan. The cakes never fell in the pan...Look have marvelous. That's a 2 inch cake, my friends! I did add some chopped peanuts between the layers. Cuz, ya know. Peanuts, nuf said. 1. Preheat oven to 350 degrees. Grease and flour two, 8 inch cake pans (I used the 2 inch side size; mine are actually pizza pans). Place a round of parchment paper in each pan. 2. Combine all the cake ingredients, except the bananas and toffee bits. Mix in a stand mixer on low for about 30 seconds. Scrape bowl. Beat for 2 minutes on medium. Mix in the bananas and toffee bits, by hand or with the mixer on low, until just combined. 3. Pour into pans evenly. 4. Bake for 38 minutes. Yes, 38 minutes. Bake until a toothpick inserted comes out clean. The cake will be springy to the touch. 5. Remove to a rack and let cool in the pan for 15 minutes. 6. Loosen sides and gently remove from pan. Cool, top side up, on a rack for at least an hour. 1. Beat butter and peanut butter in a stand mixer for 30 seconds on medium. Scrape bowl. 2. Add the cream and vanilla extract. Beat for 30 seconds on medium. Scrape bowl. 3. With the mixer on low, gradually add the confectioners' sugar. Mix to combine. Scrape bowl. 4. Add the honey. Beat on medium for 30 seconds. Scrape bowl. 5. Add corn syrup in 1 tbsp increments until you achieve the desired consistency. Once you achieve that, beat on medium high for 1 minute until light and fluffy. Trust me. I took this cake to work and it was consumed by noon...Probably fed 14 folks. Everyone really loved it and I only got this piece. But, oh, what a piece...And, the FROSTING! Youza!! Great recipe inspiration, Jocelyn!! I have a really good, good friend coming over for dinner next week. She's sans booze (wee babe on the way), so I'm going to make chocolate cupcakes with this peanut butter (and honey) frosting...I just can't get enough. Seriously. SO good. I used Tupelo Honey, so I think Susan's reminder of Elvis' sandwich may require a recipe name change in the future? 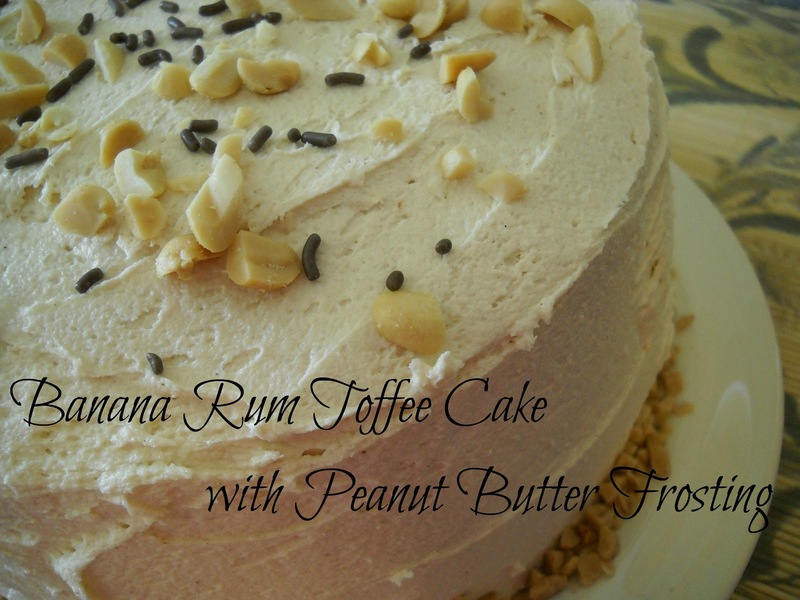 Elvis' Banana and Peanut Butter Cake? Thanks again!! Well I'm pretty picky about my peanut butter confections; don't generally like peanut butter cookies, but love peanut butter and chocolate. I was thinking this might be too PB heavy, but to my delight this was just perfect! Of course one great attribute of this cake is that you can rationalize eating it in the morning as a "breakfast cake" rather than a dessert...well that's my story and I'm stickin to it. Yum! Now I understand your reservations that it sounded "rich" that morning. Not heavy at all. :) I'm glad you enjoyed it and shared a piece with Trina. And, I do think this cake hits almost all the food groups...So, it's okay for breakfast afterall! WHAT!? How in the world did I miss this?! OMG, I die for banana cake--it's one of my favorites! Plus toffee and peanut butter frosting? OMG.